Sunday, October 4th around 8:30 a.m. my wife woke me and announced that the water in the pond behind the house had reached the top of the dam and was beginning to breach over the road. She said our neighbors were moving cars out to higher ground, in case the dam failed. I moved my truck to the adjoining neighborhood and walked back to the house through ankle deep water. Sunday, October 4th around 10:00 a.m. I sat down in front of the TV to watch the news and discovered that flooding was occurring throughout the Columbia area. They also reported that SCE&G had opened the floodgates at Lake Murray dam to relieve the pressure from upstate flooding. This was the first time a water release of this magnitude had occurred since the 1960s. All of that water was released into the Saluda River, which is less than a half mile from Carolina Wildlife Center. I got in my truck and headed toward the center. As I crossed the Lake Murray dam I could see the release of water through the floodgates. What I saw caused me to call the center to make sure it was still there. Julie McKenzie, our Director of Rehabilitation, answered and said that she had not been outside in a while but every thing seemed okay. Sunday, October 4th around 11:15 a.m. As I turned into the parking lot, I could see the property was already beginning to flood in the wooded area where we have our summer camp. I drove a stick in the ground at the edge of the water and walked inside to check on the staff and animals. After inspecting the outside aviaries and clearing some ground cover to allow the streams of water to flow around the backside of the building, Julie and I walked out to the parking lot. The stick I had put in the ground as a marker was covered by water. A quick calculation indicated that the water was rising at a rate of 6 to 8 inches per hour. If this continued, the building would be taking on water within five hours. It was time to make a decision. We had never done this before and would have to make up the plan as we went along. Sunday, October 4th at 12:45 p.m. I posted on Facebook that we needed to evacuate the wildlife center. 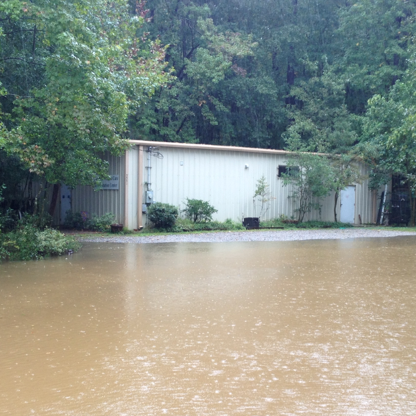 The water was rising across our property and we had no idea how high it might get. There were 400 animals in the center including our Education Ambassador animals and we needed a place to retreat to quickly. Within minutes of that post we received the first calls and Facebook posts from individuals offering to take animals into their dining rooms, spare bedrooms and garages. Over 40 offers of safe, dry, high ground poured in over the next two hours. When we learned that the fellowship hall at Providence Presbyterian Church was available, it was an all-out push to load every vehicle available and get them on the road. The church was the one place large enough to house all the animals in one location and offered a commercial kitchen for meal preparation. We franticly packed everything we thought we would need to care for the animals: food, bedding, medicine and spare equipment for the animals we might receive while we were away from the center. Sunday, October 4th at 2:45 p.m. Volunteers began lining up in the parking lot to help transport animals. As the first load of animals and supplies from the center left for the church in West Columbia, we began to hear that law enforcement was closing roads due to the rising water. Sunday, October 4th around 4:30 p.m. We returned to the center for another load and the water was at the edge of the parking lot. I was receiving texts of road closures and then a text that they were opening another floodgate at the dam. This would be our last trip. The cities and counties had announced an early curfew that evening for the entire area. We had only two hours to get back to the church, feed the animals for the night and get everyone safely home. Sunday, October 4th about 5:30 p.m. As I locked the church doors behind us, it was time to figure out safe routes for everyone to get home. The usual roads home, for most of us, were not an option. Downed power lines, barricades, flooded roads, washed out roads and failed dams blocked the normal routes. The idea that if you can’t go forward, you can always go back ended when I crossed a small bridge over a stream and the Sheriff barricaded the road behind me. This raised questions as to whether we would be able to get back to the church in the morning, as well as fears that the rising water might have reached the wildlife center. Sunday, October 4th at 8:07 p.m. I posted on Facebook that thanks to staff, volunteers and church members, all the animals were safe and dry. Now we would wait and see if the center would stay dry as well. Monday, October 5th at 10:04 a.m. We were finally able to make our way around the road closures to check on the center. Floodwaters had made it to the door and stopped. There was one to three feet of standing water on three sides of the building, and the rear of the property was inaccessible. With electrical power outages and power lines down in the area, we were advised not to wade into any standing water. The water level in the camp area had reached seven feet deep. We also understood that that floodgates were still open and that opening additional gates might be required that night. So again, we waited. Tuesday, October 6th at 10:30 a.m. We arrived at the center to find that the water was receding back to the tree line and it was safe to enter the building. The power was back on, and while the entire building smelled damp, there were only a few places where water had gotten in under walls and up through the floor drains. The biggest problem was bugs. Every spider, silverfish and palmetto bug for miles had moved in while we were out. The next few hours were spent moping floors and spraying insecticide. 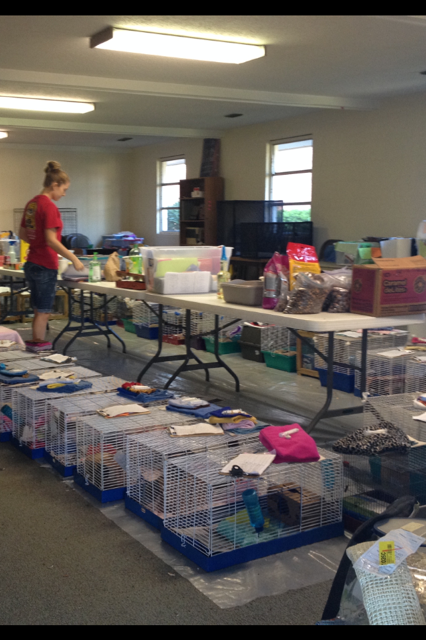 Over 400 animals were moved to temporary housing at a local church during the flood. Wednesday, October 7th and Thursday, October 8th Back at the temporary “nest” or “ark”, as some had named it, things were getting organized and flood rescued animals were beginning to arrive. Word of our evacuation had spread across the country and shipments of donated supplies were coming in from as far away as California, Washington state and New York. Locally, people were volunteering to take enclosure laundry home or to the Laundromat, and showing up at the center to help clean. Friday, October 9th at 8:00 a.m. 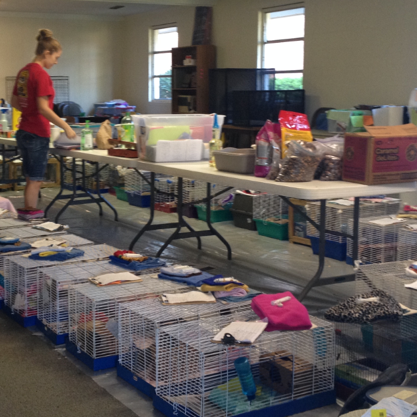 Volunteers began arriving at the center to help prepare for the animals to return on Saturday. Everything was removed from the building and washed. Every surface, inside and out was disinfected. Every cabinet was emptied and the contents washed. We were under a boil water advisory, and hundreds of gallons of water were donated to clean and fill turtle tanks. Over the course of the day, over 50 volunteers of all ages joined in the cleanup. A local Girl Scout troop accepted the task of putting our summer camp area back in order. 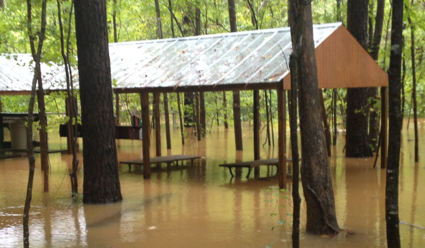 We had over seven feet of water flood the camp area and the picnic tables had floated up against the fence. These young ladies raked, cleaned and got everything back into place. Other volunteers cleaned aviaries and outside enclosures as the work continued until dark. Saturday, October 10th at about 9:00 a.m. It started raining and looked like we would return home in the same weather in which we had evacuated. By 10:00 a.m. the first volunteers showed up at the church and began running a caravan of animals and supplies that would last all day. Cars, minivans and pickups made trip after trip until the last load was delivered. By 6:00 that evening everything was in its place. Except for a box of files and the power cord for Barkley’s (our barking tree frog) mister, everything was accounted for and things seemed to be back to normal. The effect of this storm and flood will linger for a long time in this community. Many families and businesses lost everything. 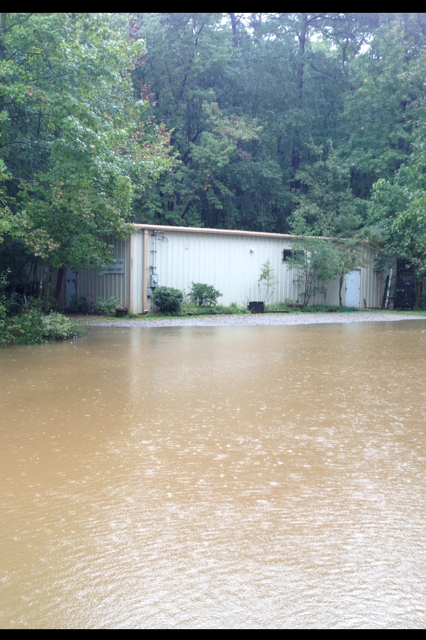 As for Carolina Wildlife Center, our losses were small: a freezer, some food stocks and educational materials. All of these are things that can be replaced. On the other hand, it is not what we lost, but what we found that has had the greatest impact on us. We found old friends and new friends who share our concern and compassion for wildlife. Friends who will give their time, energy and resources to ensure the care of our injured and orphaned wild animals. We found a church full of people willing to open their hearts and doors to take care of God’s creatures in need. We found that we can do whatever it takes to care for the animals entrusted to us, under whatever circumstances we face. To our staff, partner rehabilitators, volunteers and supporters, we thank you and we know that we could have not gotten through this without you.